First, thank you for taking the time to answer so many questions throughout the world, its a very kind act and whether you believe in God or whatever I'm sure in the future you will be replenished with happiness and serenity. Anyways, I'm 17 years old, and I weigh about 200 pounds measuring 6'1 and I've always played a lot of sports. Recently I was playing football and this kid hit me really hard on the leg. By doing so i fell to the ground and my left knee was out of place and was on the left side of my leg. I popped it back to place and it hurt A LOT. I know i didnt tear anything because i was able to hop to my car and put some pressure on it. Then i went to the hospital and they told me i had an old fracture and that my knee was very swollen and that there was a lot of fluid in my knee. They gave me an immobilizer and they prescribed me to Ibuprofen 800mg. 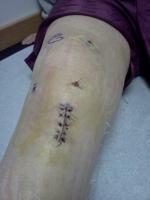 However they never mentioned what was actually wrong with my knee. Two days later, well as of right now, my knee is much less swollen and i can put pressure on it and doing so i can barely walk. But without my immobilizer my knee hurts a lot and i cant put any pressure. Now im four weeks away from a field trip to busch gardens (a theme park) but if i want to go i have to pay by two days. I really dont want to pay if i wont be able to walk but i also dont want to miss the trip. A) Do you think I'll be able to walk by then? B) will i be able to gain function of my knee completely? C) Approximately how long, until i can walk again? D) what do you suggest i do for a full and quick recovery? Thank you so much, i really appreciate the advice and sorry for the bother.